Chelan County is in central Washington state, bordering Douglas County and the Columbia River to the east, Snohomish County to the west, and Kittitas County to south. Most of the northern portion of Chelan is mountainous forest of the Okanogan-Wenatchee and Mt. Baker-Snoqualmie National Forests. It also includes Lake Chelan, one of the state's largest lakes, and Lake Wenatchee, two popular area destinations. The county seat and largest city is Wenatchee, population 33,000. Other communities include Chelan, Sunnyslope, Leavenworth, and Cashmere, all concentrated in the east or southeastern parts of the county. Chelan County is largely rural, though winter sports and summertime lake activities bring visitors year-round. 2 Beds | 2.5 Baths | 1240 sq. Ft.
3 Beds | 3.5 Baths | 3018 sq. Ft.
3 Beds | 2 Baths | 1938 sq. Ft.
4 Beds | 2.5 Baths | 2890 sq. Ft.
Blue Summit Realty has the most accurate and up to date Chelan County real estate listings on the web. Currently there are 174 homes for sale, 65 condos for sale, 2 rental properties, and 334 vacant land properties in Chelan County. Of the 581 total Chelan County residential listings for sale 1 are bank owned, 1 are short sales and 61 are new construction and 0 are townhomes. The price ranges from $62,500 to $5,500,000 with a median list price of $434,080 and median sold price of $328,238. 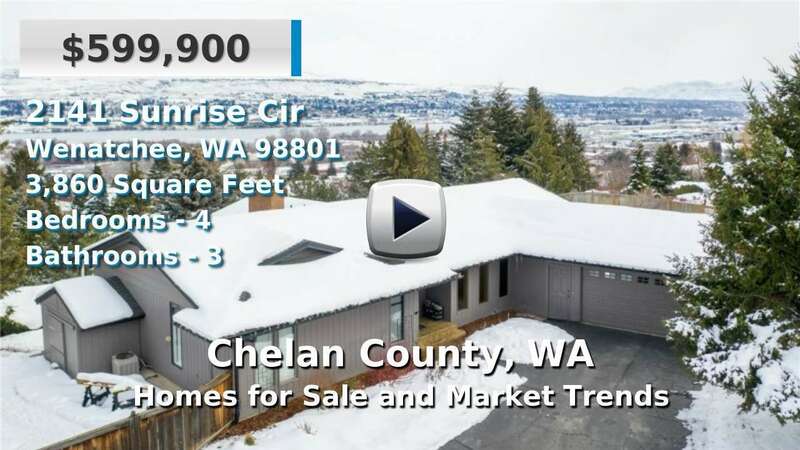 Make sure to refine your Chelan County real estate search by property type, price, square footage, bedrooms, bathrooms and more with the search tool above or view the Chelan County listings on our interactive map. Our Chelan County real estate listings were updated 6 minutes ago.